The year was 1956 and the Staley Mfg. Co. was preparing to celebrate its Golden Anniversary. There were many reasons to celebrate – the company was a success in both its corn and soybean processing, A.E. Staley, Sr. was recognized as a leading citizen for his many successful contributions to the community of Decatur, and, perhaps most significantly, World War II was over and the country was recovering both economically and in sprit. This was a golden opportunity for Staley Mfg. to do something on a grand scale. Letters were written, phone calls were exchanged and the decision was made to plan an event focused on the Staley connection with the Chicago Bears. The celebration would include not only the company’s history and successes but also recall that glorious year when A.E. Staley dove head first into the world of sports and created a football team that grew with a momentum of its very own and became a definitive presence in the newly founded National Football League. James H. Beaumont, director of public relations, was put in charge of organizing the event. Beaumont said that this day would be a reminder that A.E. 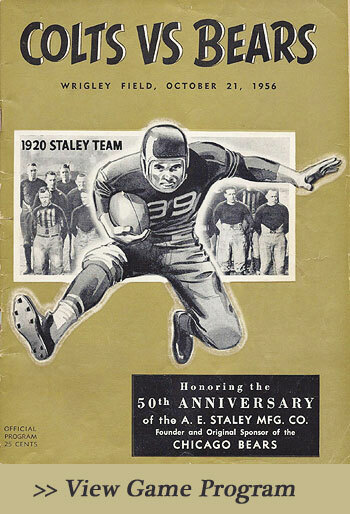 Staley was not only a pioneer in starch and soybeans but also in professional football. 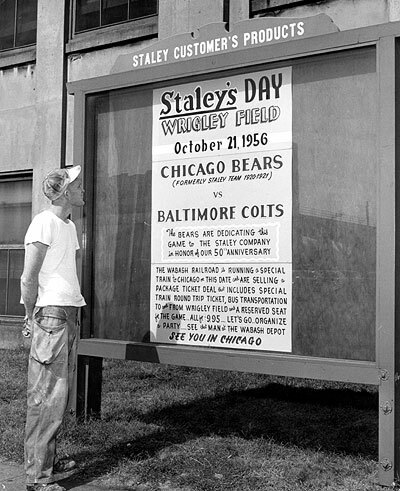 Staley Day at Wrigley Field was going to be an event to remember. Among the preparations that were made was an arrangement with the Wabash Railroad to provide a special train to transport 500 Staley employees and family to and from the game, with bus transportation arranged to take everyone from Dearborn Station in Chicago to the Wrigley Field and then back again. An additional passenger coach was added to the train to transport the University of Illinois marching band. Also, everyone would have a reserved seat at the game. All this for the incredible price of $9.95! For the Chicago Bears, this was a day to celebrate not only the company that gave them their start but the history and the foundation of the football league and game they loved. George Halas spent the day nostalgically recalling the early days when he was coaching and playing for that first team and A.E., Sr. would cheer from the sidelines. The halftime ceremony was one to be remembered by all. Many of the original team players were present and were called down to be honored on the field. George Halas and A.E. Staley, Jr. (Gus) spoke to the crowded stadium. The University of Illinois marching band played and marched into a formation spelling out the name STALEY.